Every time we look at computer screen, millions of pixels of light disappear into our work, our correspondence, or our entertainment. Imagine if you could capture those dots of light and scoop them up as you would grains of sand on the beach. Puzzlemation explores this idea, by dividing the digital display into pixels you're free to pick up and re-arrange. It can be used to create things as diverse as modular animated signs, to a uniquely challenging dynamic puzzle. It is a tool that lets you create animated light displays of any size and shape for whatever applications you can dream up. 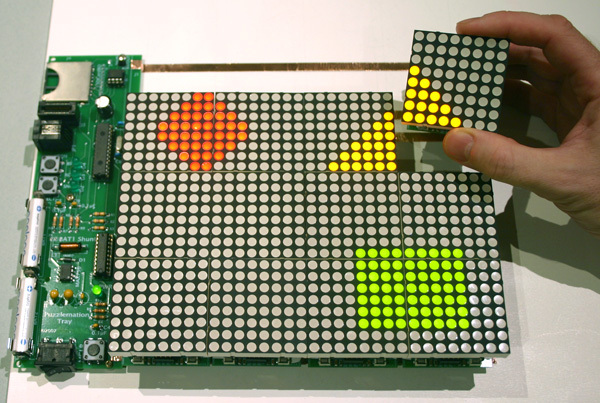 This project's display is made of a number of tiles, about 2" square with an 8 x 8 array of color LED pixels. Each tile is individually powered and animated, so your can freely pick them up and re-arrange them. To set up a display, the tiles are placed in a special tray. Animations are downloaded into the tray via Ethernet and stored locally on an SD card. The tray broadcasts the animation to each of the tiles, and then synchronizes them. If the pieces are left in the tray, the animation can be updated continuously over the Ethernet connection. If the tiles are removed from the tray, they'll display the animation for several hours with their own re-chargeable battery power. Once the animation is synchronized and running on the tiles, you can pick them up and place them anywhere. 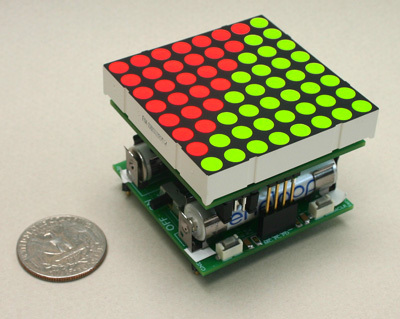 The display is completely reconfigurable. Need a tall thin display, a square one, or a long skinny one? No problem - re-arrange the tiles as you please. 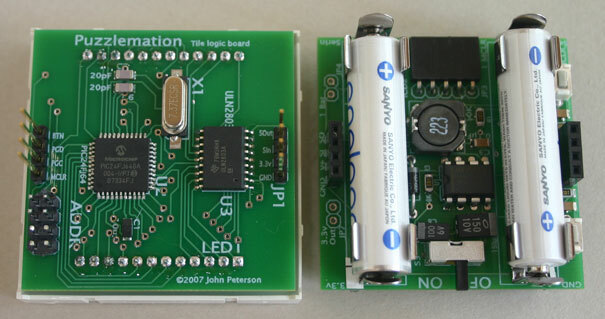 Puzzlemation was awarded Distictive Excellence in the Microchip 16-bit Embedded Control Design Contest 2007, and an Editor's Choice Award at the 2008 Bay Area Maker's Faire. A document with a more detailed description and schematics is available here [PDF 290K]. A feature article on it appears in the December '08 issue of Circuit Cellar magazine. It's also been featured on Hack a Day, Sparkfun.com and Tom's Guide.